After a summer of boring friendlies, fun Fifa arrests and a pretty exciting Women’s World Cup, the Premier League is finally back this weekend and the football machine cranks into full gear. My team, Tottenham Hotspur, the Mighty Spurs (so called because we Might Be Good This Year, but we Might Not), play the Van Gaal led Manchester United in what is another dawn raid, as the kick-off is at 4:45am my time. That’s too early for me, but at least I can go back to bed afterwards. Anyway, you may recall from the 2014 World Cup I am a little obsessed with football kits (soccer uniforms, as some of you call them, “lol”). I made, if you remember, a definitive guide to all the kits of the World Cup with little illustrations in the old version of MS Paint. It was in three parts, which I’m calling Part 1, Part 2 and Part 3. I really liked doing that, and so I am revisiting the idea with a run-down of the Premier League kits for 2015-16, along with a few bonus Johnny Foreigner kits too. I really want that Sampdoria kit. I wasn’t sure how to organize them at first. ‘Alphabetical’ seemed too boring, Chronological as to when the kits were released was pointless, and while ‘autobiographical’ seemed like the most ‘no f***ing way’ choice it was ultimately impossible, so I went for ‘placement in last year’s Premier League’. Without much further ado, we will start with the 2015 champions. Jose Mourinho’s team won the league quite comfortably in the end last year. That pleased Jose. Will they win it again this year? Probably. The new kit is slightly different this year, with a button up collar, and a very thin red and white trim. I like Chelsea having the red trim. I don’t like Chelsea though. They have a new sponsor this year, Yokohama Tyres, whose spelling will confuse and hopefully alienate the American market. The away kit is nice, a pretty simple style, all white except the blue socks. 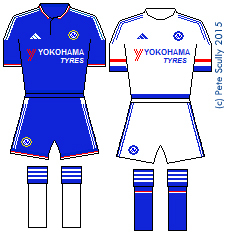 I’ve always loved that Chelsea have white socks in their first kit, it’s almost obstinate, like Jose went back in time and made white socks a Chelsea tradition just to annoy Arsene Wenger and make Arsenal change their socks when they visit Stamford Bridge. More Mourinho mind games. Manchester City. They should be the epitome of the whole billionaire oil barons buying football thing that I hate…but I can’t hate City. For too many years they had it so, so bad, while United gobbled up mountains of silverware. They made Spurs’s fallow years look likethe Belle Epoque. Will they win the league. Yeah maybe, I don’t care. The kit though is lovely. I’m a huge fan of those rugby collars that Nike (and previously Umbro) are so fond of now, and it works best with the white trim. 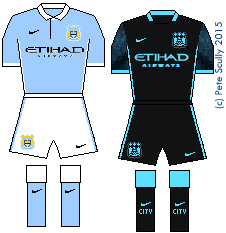 No more black trim please, City. This is a smart kit. The black and aqua-blue away kit is interesting, because the arms feature lunar topography in blue and black, because of the whole ‘Blue Moon’ thing. I like the song Blue Moon too, but it always reminds me of that scene in Grease. I’m a Spurs fan, so naturally Arsenal are the enemy, but I have to admit they are looking pretty good for a run – but they wonn’t win the league because they don’t o that any more, not since the mega-billionaires entered the Premier League. I do like Wenger (especially when he is throwing water bottles onto the ground); his time at Arsenal is equivalent to the current tenures of all the managers in England put together, I think. 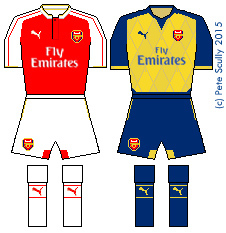 The kits are nice this year, another button up collar (I like those) and a stylish Puma design. The away kit is the classic yellow (gold) and navy blue with funny shiny diamonds. There’s a hint of that awful zigzag away kit from the early 90s if you ask me. Maybe they should bring that back. United are back with Adidas, who they haven’t worn since before the Premier League started, ie back when they spent years never winning the title. Rather fitting since they are starting a new and probably similar era. Hey remember the old Adidas kits, yeah they were great, Ron Atkinson, Fergie before he was good, Gordon Strachan, Peter Davenport, Paul McGrath, Robbo, yeah great but no league titles. Will Van Gaal drag them and their multi-million pound players back into Fergie-era winning ways? I can’t see it. It’s back to the 80s alright. The kit itself is based directly on their kit from 1983 (they won the Cup that year! Beating Brighton & Hove Albion in a replay!). As of today, hours from the new season’s kick-off, they haven’t even bothered to release their away kit. Can’t imagine it will be earth-shattering. I don’t have very high hopes for my beloved Spurs this year. We’ve gotten rid of some of the dead wood (Paulinho) and bought more Belgian, but if we are some sort of quiet dark horse, we must be Black Beauty wearing slippers and a gag. We’ll finish about where we have been finishing. I predict young Harry Kane will probably score a few goals. Pochettino will be hoping Daniel Levy has switched off the ‘Sack Manager’ reminder that will come up this November, as it does. I love the kits though. Under Armour are doing a good job of making us look different to all the other template teams. The sash is interesting on the home kit. I will get that one. I like the blue away kit, but my wife doesn’t so I probably won’t get that one, unless I get it in secret and only wear it when she’s out. The purple one is lovely too, but I can’t spend all my money on football shirts now can I. Can I? Liverpool struggled post-Suarez and did well to come sixth but could (and probably should) have placed lower. Thankfully, Warrior Sports have given up making football kits (last season’s were probably the worst kits I’ve ever seen). 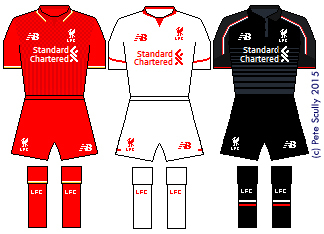 So this year Liverpool’s kits are being made by…New Balance. Ok. On the face of it the designs are simple. Not super interesting. White away, black third, bespoke designs but, nothing to write home about. Move along. Southampton did well to come seventh but could (and probably should) have placed higher. The last time they were adidas, they inexplicably got rid of the stripes (Umbro technically did that, though they had white pinstripes if you want to quibble), but worse (in my opinion) was making the shorts red. Red shorts? Southampton? Are you insane? (ok, Umbro were guilty of introducing that too). It looked so many types of wrong, and to top it off they had a gold trim. 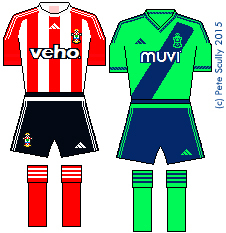 However for all the outrage, kits only ever last a year and so the next season, adidas were out and Southampton produced their own kits, with stripes, with black shorts, all was right in the world. 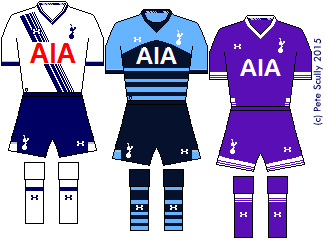 The kits themselves were rumoured not to be great quality but who cares, the players were great on the pitch (despite Spurs et al raiding their manager and best players before the season). This year they have Jordie Clasie, so I think they will do well again, but adidas are back on board and have given them a bog standard template for their home kit (“you want stripes? Fine here’s some other team’s old kit, we don’t care”). The away kit though is in a highly radioactive shade of green and navy blue. And there are last year’s top seven*. Next year’s too probably. One thing I’m not doing this year is giving a list of predictions. I did that for years, under the direction of a cosmic entity called Mystic Pete (I was Mystic Pete’s representative on this planet, don’t ask, it was a long story). Mystic Pete was often hilariously wrong (Mystic Pete predicted Newcastle would win the league once, the actual league title), so I stopped asking. But if pushed, I’ll say one of the teams in this list will win the league. Enjoy day one, footy fans, and I’ll be back with more kits soon. Lots more Urban Sketches first, but then some more footy kits. *Originally this was the top six. But I forgot about Liverpool originally so this is the top seven. Next post there will be the middle seven, then the last six plus maybe one from the lower leagues. Then it’s Johnny Foreigner.